This top is the perfect addition to any wardrobe. This top can be worn for a multitude of occasions, which will allow this to be your new season favourite. 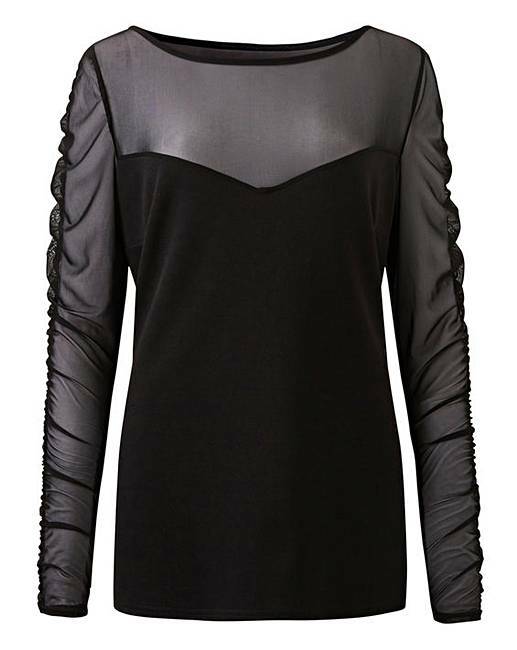 The flattering sweetheart neckline, paired with the ruched mesh sleeves really helps to bring this product alive. Designed to flatter, and accentuate all the right places, it's guaranteed to make you feel the way you will look – fabulous! Try pairing with high-waisted distressed jeans, and your favourite mules for that ultimate 'casual evening drinks' vibe. Main: 97% Polyester, 3% Elastane. Contrast: 95% Polyester, 5% Elastane.